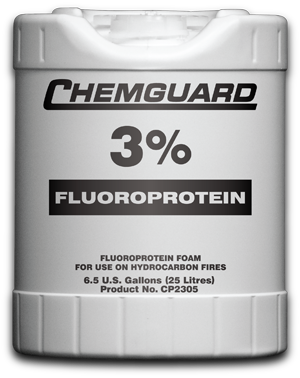 Chemguard CP2305 is a UL Listed flouroprotein foam concentrate containing fluorinated surfactants in a carefully formulated protein foam liquid base. This ensures the production of a stabilized fluid foam which will cover a burning hydrocarbon fuel surface rapidly. 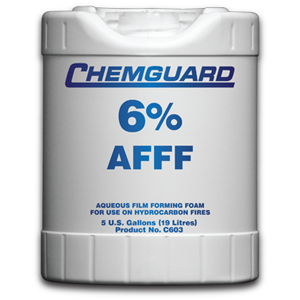 The water soluble fluorosurfactant makes the foam hydrocarbon repellent and reduces the amount of burning particles absorbed by the foam in fighting the hydrocarbon fuel fires. Once the fire extinction has been achieved the high stability of the foam blanket ensures against the risk of reignition and provides excellent protection against burn back should any inaccessible pockets of fire remain. Chemguard CP2305 should be used at 3% proportioned solution (3 part concentrate in 97 parts of water) in fresh or seawater. Chemguard CP2305 is intended for use on class B hydrocarbon fuel fires such as oil, diesel and aviation fuels. Chemguard CP2305 can be applied directly onto the fire surface and is also suitable for sub surface injection. It is compatible with all dry chemical powders and can be used in powder/foam twin agent systems. Balanced pressure, variable flow proportioning systems. Around the pump proportioning systems. Water turbine driven foam proportioners. Self inducting branch pipes and nozzles. 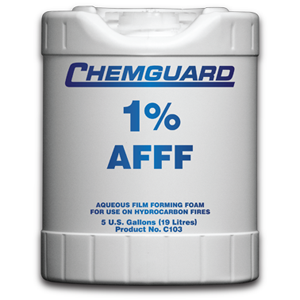 The fire performance of Chemguard CP2305 is measured against standards such as Underwriters Laboratories Standard UL 162 at 3% concentration. The expansion will vary depending on the performance characteristics of the equipment used. Stored in original unbroken packaging the product will have a long shelf life. The recommended storage temperature range of Chemguard CP2305 is from -15°C to 49°C. As with all protein based materials, shelf life will be dependent on storage temperatures and conditions. Freezing and thawing will have no impact on the performance.